Thanks to Dr. Samia Abdel Razik, Saudi-German Hospital, Jeddah, Saudi Arabia, for contributing this case. To contribute a Case of the Week, follow the guidelines on our Case of the Week page. The Genomic Health Oncotype DX� Breast Cancer Assay provides early-stage ER-positive breast cancer patients with an individualized Recurrence Score� result that assesses the benefit of chemotherapy and the likelihood of 10-year distant recurrence. The Recurrence Score is calculated using RT-PCR technology to assess the expression of 21 genes in a patient�s FPET core biopsy or surgical excision sample. The assay is precise, accurate, and highly reproducible over a wide dynamic range, with a success rate of >97%. The assay is validated in 13 clinical studies involving more than 4000 patients. For more information, please visit www.oncotypedx.com. Oncotype DX and Recurrence Score are registered trademarks of Genomic Health, Inc.
A 37 year old woman complained of lower abdominal pain. An abdominal ultrasound revealed a right ovarian solid mass, which was excised. The ovoid mass measured 5 x 4 cm and had a glistening smooth outer surface. The cut section was yellowish with areas of hemorrhage. 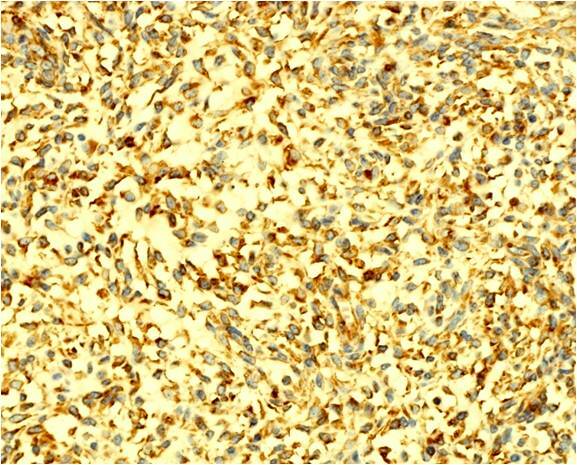 The tumor cells were immunoreactive only for Vimentin (see above), and negative for cytokeratin, EMA, AFP and chromogranin. The vacuoles were negative for PAS, Alcian blue and Sudan III. Ovarian signet-ring stromal tumor, first described in 1976 (Cancer 1976;38:166, free full text), is a very rare tumor, with less than 20 cases reported to date. Histologically, it is composed of spindle and round cells, which contain a large cytoplasmic vacuole which displaces the nucleus, resembling a signet-ring. Numerous cells may show intracytoplasmic hyaline globules, which may actually be degenerating erythrocytes phagocytosed by the tumor cells (Ultrastruct Pathol 1995;19:401). The tumor cells are immunoreactive for vimentin, actin, inhibin and calretinin. They are negative for keratins, mucin and lipid stains. Ovarian signet-ring stromal tumors are classified in the Thecoma-Fibroma category of ovarian tumors. They may be related to ovarian sclerosing stromal tumor (Pathol Res Pract 2010;206:338). 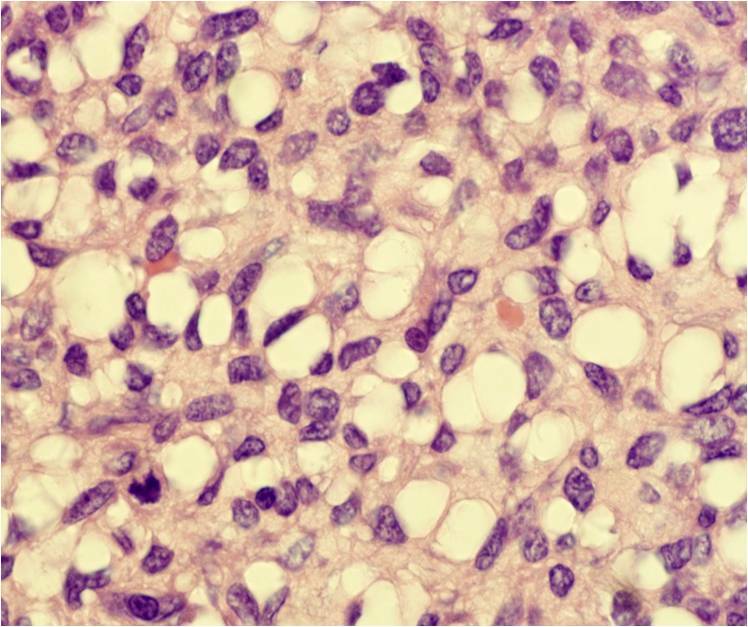 The differential diagnosis includes other signet-ring tumors, including Krukenberg tumor, primary or metastatic mucinous carcinoma of the ovary, mucinous carcinoid tumor and clear cell carcinoma. 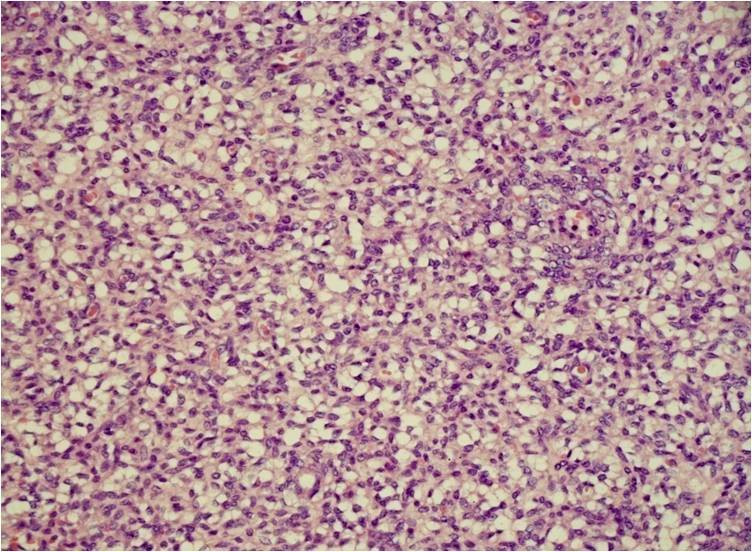 All of these tumors have some epithelial component that is immunoreactive with keratin. 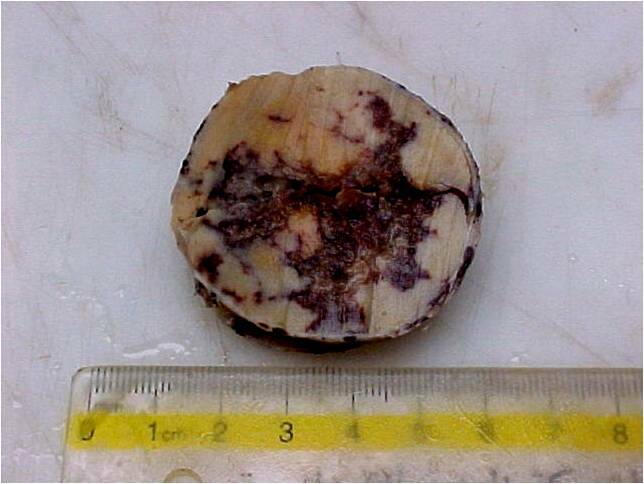 Krukenberg tumors are often bilateral or associated with extraovarian tumor. The signet-ring cells are immunoreactive for keratin and PAS-diastase, and negative for vimentin (Int J Gynecol Pathol 2004;23:45). Ovarian signet ring stromal tumor has benign behavior, and excision is curative.